In little less than a second Vail had a decision to make. Option one, continue the draw, shoot her in the head, and hope he could grab the detonator before she depressed it. Option two, leave his gun where it hung, attack with bare hands, get the detonator before she depressed it, and then find out who the hell she was and why she’d broken into his office. Deciding on option two, he released the gun and coiled slightly to strike. But a closer look brought that train to a grinding halt. A long lever compressed between a slender metal box and her palm. That, combined with the distance she put between them, railroaded a surprise attack. “Yes.” He held his body loose, waiting for any opening, while he catalogued the intruder. Five-eight, maybe five-nine. Slender frame. Full breasts. Not important at the moment, Tucker. Still, he couldn’t help but notice how the thin cotton fitted the pretty mounds and dipped at the sway of her waist. He moved on. Belt with extra magazines. Knife strapped to thigh. Bulge at ankle, probably a small cannon. Dark, sad eyes. Light caramel skin. Smooth. Long lashes. Heedless of the warning, his body stirred. Tracking his options, he did as she asked, knowing what came next. Her gaze didn't rove like his had, but speared him in the solar plexus. A nice trick to watch the surrounding area and your target at the same time. “I don't expect talking ranks high on your to-do list,” he said, dropping his weapon into the shallow drawer and pushing it closed. “Really?” For a reason completely concealed from understanding, the words, ‘I think we’d fare better with action,’ tickled his tongue. He swallowed them, but his brow and smirk refused to fall in line. She surged forward one brimming step. The gloved hand not holding the key to their possible doom snapped to her hip. Her gaze rose and lanced his own. “Yes,” her sweet voice lashed like the end of a whip. Vail remained still and watchful, a ready predator to his unsuspecting prey. She calmed in stages, as if summoning all her strength to rein a simmering rage. Again he inspected her eyes. There was no more accurate tell about a person’s mental state than the eyes. They were windows all right—he just didn’t think soul described what they revealed. Intent. Sanity or the lack. Direction. Fear. Malice. Truth and lies. If only they’d differentiate the lies from the truth. The hue of her big rounds matched his coffee—devoid of cream or sugar—and the eyes that stared back in the mirror every morning. Only where his gave nothing away but the chill of earth’s poles, hers revealed everything. Passion. Fear. Determination. Stability. She’d done her homework because she knew just how to tweak him to get the desired results. His people and the security of his organization trumped it all, even his own wellbeing. Most of his people were currently on mission, but the lives of the few who remained were in his hands. Plus the lives of those on the thirty-one floors above them. Yeah it was late, but more and more people put in grueling hours, striving for that next corporate rung or avoiding home life. He couldn’t make a move without endangering their lives. So he’d ride this wave a bit further and look for a safe break for land. The mask moved around her mouth, but she didn’t speak. A smile, maybe, or a frown. He hated not being able to see her face. The tiny gestures lost behind the knit also gave vital clues to a person’s intentions. 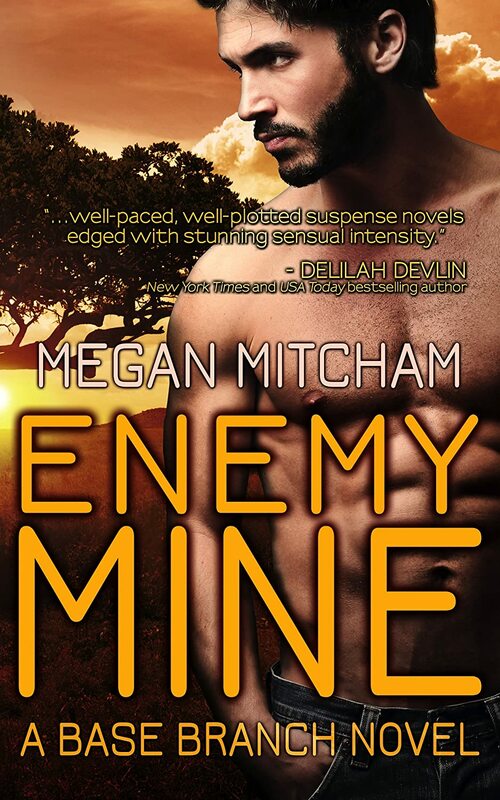 Tell me in the comments below who your favorite book boyfriend is and what quality made him achieve that rank and one lucky commenter will win a digital copy of EnemyMine, the first installment of The Base Branch Series. Giveaway ends 11:59pm EST January 16th. Please supply your email in the post. You may use spaces or full text for security. (ex. jsmith at gmail dot com) If you do not wish to supply your email, or have trouble posting, please email maureen@justromanticsuspense.com with a subject title of JRS GIVEAWAY to be entered in the current giveaway. A favorite of mine is Hardy Cates from Blue-Eyed Devil by Lisa Kleypas. He was a bit rough around the edges but was sweet when he fell in love. A favorite of mine is Dare McIntosh from When You Dare by Lori Foster. When he rescues Molly from her kidnappers, he's intrigued. Then his interest becomes sexual. But the more he gets to know her, the more he falls in love and vows never to let anyone get to her again, no matter who he has to take on to keep her safe, including her own father! Dare is a strong, determined individual, fiercely loyal to those he cares about, with a heart for justice and a desire to put a stop to any and all bad guys, whoever they may be. Izzy Zanella in Breaking the Rules by Suzanne Brockmann. This Navy SEAL uses humor to manage through situations, so much so that I didn't take him seriously early on in the Troubleshooters series. But his heart is fierce and he sacrificed everything for Eden. This book sounds yummy! Will Trent from The Will Trent Series from Karin Slaughter. His adversities that he has with dyslexia and what he does to overcome this. Picking a fav is hard for me, but one guy that always comes to mind is Roarke from JD Robb's In Death series... gotta love that Irish bad boy! Chief Cosmo Richter from Hot Target by Suzanne Brockmann. He was the *perfect* hero :) I reread that book at last once a year. Thanks for sharing! Right now my favorite is Ned Stark from the series A SONG OF ICE AND FIRE. He is noble to a fault.